Guyana Bank for Trade and Industry Limited has a rich and successful history of over 180 years that began with the establishment of the first Commercial Bank in British Guiana, the Colonial Bank, in May 1836, continuing with the operations of Barclays PLC. In 1987 the assets and liabilities of Barclays PLC were acquired by the Government of Guyana and renamed Guyana Bank for Trade and Industry Limited. GBTI was officially opened to the public on December 1, 1987. 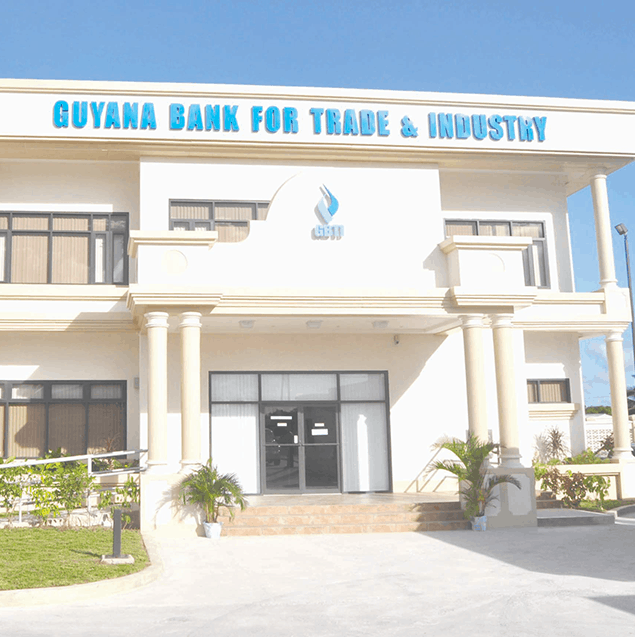 In January 1990, GBTI merged with Republic Bank (Guyana) Ltd formerly Chase Manhattan Bank N.A, and in 1991 the Bank was privatised. With over 1,800 shareholders, the majority shareholder Secure International Finance Company Inc. holds 61% of the shares. Today, GBTI provides an extensive range of services to its Corporate and Individual customers. Personal Savings, Business and Investment Accounts; Personal, Housing and Business Financing; Credit Cards and Visa International Debit and Credit Cards are all offered by our Corporate Office and twelve (12) Branches spread across Guyana. GBTI makes life so much easier with Mobile and Direct Banking and easy access to over 25 ATM locations and Point of Sale Service at more than 235 merchants across Guyana. Our large network of correspondent banks facilitates reliable and efficient international business transactions including Electronic Payments, Foreign Currency Drafts, Cambio facilities, Foreign Currency Accounts, Letters of Credit and Bills of Collection among others.